GEORGETOWN - According to a report published in the Guyana Guardian, Former attorney general Anil Nandalall, who is also currently acting as the lawyer for a number of former Guyana government officials who were arrested by the Special Organized Crime Unit (SOCU), has now found himself in the same predicament as his clients and political colleagues. 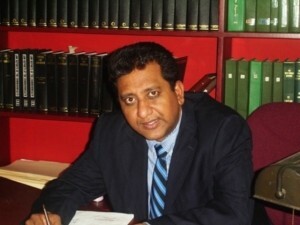 According to reports, Nandalall was arrested on Monday by ranks of the Special Organized Crime Unit (SOCU) after a state-sponsored forensic audit had suggested that the well-known attorney was criminally culpable for the disappearance of several law volumes. Nandalall, who had also served as Guyana’s minister of legal affairs in the previous administration, had repeatedly faced accusations from the current administration, which considers the law volumes that are currently in Nandalall’s possession, as stolen state property. That position has been consistently upheld by the state, which saw incumbent attorney general, Basil Williams SC, pressing Nandalall to return the volumes since they were purchased with state funds for the attorney general’s office and are still considered state property.